In the light of some very interesting comments on ashi-sabaki following last week’s post, I wanted to take some thoughts on footwork from Matsumoto sensei’s teachings. 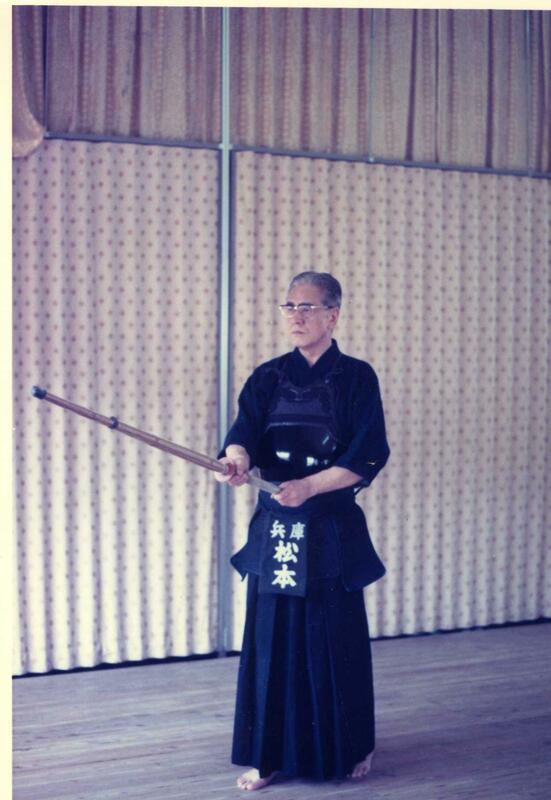 However, the way he explained the whole process of kendo movement makes it almost impossible to separate the actions of different parts of the body, so I have taken the liberty of re-posting some lecture notes which I first posted in 2009. I have shown the text relating to foot movement in blue, but as you can see, these instructions are an integral part of of describing how the whole body should move. 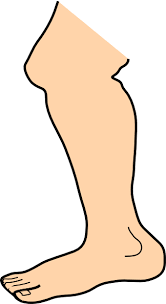 The left forearm should be at 45 degree angle to the ground and the thumb of the left hand should point to a spot about 30 – 40 cm in front of the big toe of your right foot. The thumb of the right hand should point forward almost at a horizontal angle. The left foot should touch the floor at the point between the ball of the foot and the plantar arch and the heel. The toes should touch the ground in the way that is called, “a cat walking” * as if a very thin sheet of paper is placed between the toes and the ground. By raising the left heel from the floor, the distribution of weight becomes 70:30 between the left and right leg and 70:30 between the front and back of the sole of the left foot. The back of the left knee must be tense. The left heel which is now raised, should be slightly lowered. This will redistribute the weight 50:50 to the back and front of the left sole. 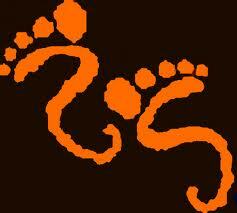 The toes of the left foot which have so far pointed slightly to the left should point straight ahead. Now with the motion of stepping out from the left ankle, you should push your right foot forward. Now the tension behind the left knee moves to a point of about 6cm above the back of the left knee and tension is applied to a slightly lesser degree to the same point above the right knee, the left hip can then be pushed forward. Step within easy reach of your opponent, without changing the position of your hands. The left hand is then raised with the right hand following in a natural movement in line with the path of the shinai. This action will cause your right shoulder to draw back. At this point the right hand is acting as support to the left and it is wrong to apply force with the right hand in order to raise the shinai. It is important that you raise the right hand with the feeling of squeezing in which will protect your kote against counter attack as you raise your hand. You should strike at the same time as you draw the left foot towards the right foot. At this point, the right hand, which so far has not been used to apply force is given the work of hitting together with the left hand, making use of the right elbow to indicate direction. Make maximum use of the power and flexibility of your wrists and use the integral power of your waist, back, shoulders and arms. (You should pursue the correct way of hitting so that it becomes possible to concentrate all your physical force into one strike*) When you make the strike the distribution of weight between your left and right legs will change to 40:60. When you strike men, the thumb of the right hand is directed to the front as if to poke into your opponents eyes. For tsuki the thumb naturally angles downward. When your opponent is in Nito or Jodan, his posture is referred to as floating and therefore is different to chudan. A chudan player must raise his hands a little to fight against Nito or Jodan to be in concert with the opponent’s floating posture and movements. * “A cat walking”, means the way of walking without making a sound. In the case of pushing from the left foot to attack, it is recommended to ease the force in the toes with the feeling of bending them slightly upward. This will increase the power of your forward step. Kendo is unusual in that we use fumikomi-ashi, “stamping footwork” instead of a more natural walking gait as part of our technique. I don’t know how this developed. Older styles of kenjutsu take a more natural left-right approach, cutting on either foot, whereas modern kendoists believe that for an attack to succeed the right foot has to slap the floor at the exact moment of striking. Followers of the many original ryuha explain that in a battle situation on rough ground, stable walking footwork is the only option and I would not for a moment disagree with them. Somehow as kendo moved onto wooden floors, we have adopted a stamping style which has become an integral part of the modern sport. Fumikomi-ashi dosa, or movement, is in essence okuri-ashi footwork with an added stamp. Okuri-ashi is the process of pushing the right foot forward using the power of your left leg and it is used for attacking movement. There are though other footwork options in kendo. We use ayumi-ashi (walking footwork) to cover long distance outside of attacking maai. Tsugi ashi lets us bring the left foot closer to the right foot than in okuri-ashi to gain a more explosive forward movement and hiraki-ashi allows us to step diagonally to make oji-waza. Many of us become addicted to okuri-ashi and fumikomi-ashi. Beginners find it almost impossible to do these correctly, but insist on using them for every circumstance. I have often seen okuri-ashi used to receive kirikaeshi whereas the natural way to do this is to use ayumi ashi. Contrary to popular misconception, it is not mandatory to stamp to make a successful attack. Nippon kendo no kata does not use stamping footwork and any of the seven odachi techniques if done correctly, would score ippon in shiai. Ki-ken-tai-itchi does not always depend on your right foot slapping the ground. In fact in many oji-waza the cut is executed as the back foot moves into place. Fumikomi-ashi is a key element of kendo, but it is reserved for making forward shikake attacks, so we can’t afford to ignore the other footwork variations. 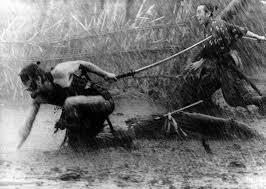 It is unlikely that many of us will get involved in a swordfight in a paddy-field, but were we to do so; the only value in fumikomi-ashi would be to splash your opponent. In the dojo we need to move at different speeds in different directions, so we should study and practice all the kendo footwork forms. We concentrated on men-uchi last week. We started by hitting men from a static position then progressed through taking just one sliding step, to stepping into distance and striking, through to hitting with fumikomi ashi and then moving into zanshin. We finished with debana men practice during which a dojo member asked for my advice on why he was having difficulty pushing off to make the strike. Instead of being able to launch an attack at will, all of his weight was moving to the left foot and he needed to readjust his foot position before he could move. Watching his practice it was obvious that the heel of his left foot was too far off the ground, to the extent that he had no traction to push himself forward. Instead he had to move his left foot forward each time that he needed to attack. To my mind a lot of energy was being wasted on unnecessary action. Matsumoto Toshio sensei talked about the sole of the left foot being at a 15% angle from the floor, with the left leg being almost straight and keeping a feeling of tension behind the left knee. If you follow this advice then it is possible to move instantly from any spot. You of course need to keep the distance between your feet constant throughout your keiko, moving the left foot into position whenever your right foot moves, but you should be able to stop at any given time and instantly launch from the back foot. How far apart your feet should be is open to debate. Conventional kendo wisdom suggests that the big toe of the left foot should be in line with the heel of your right foot and that there should be a fist’s distance separating the width of your stance. In reality some All Japan class players have a much bigger gap between the forward and rear foot and they have the leg strength to make much longer steps than us amateurs. I also believe that the fists distance in width is only a guide. In most sports, feet and knees should be in line with your hips. So your feet should be far enough apart for you to be stable and balanced. The final piece of the jigsaw is to ensure that as you push with the left the right foot moves forward and not up. By keeping a slight bend in your right knee you should be able to make fumikomi with a big slapping sound and not damaging you knee or heel in the process. Most of the comments on my last post dealt with the subject of making good fumikomi. Andrea is not unusual in having problems with this and everyone who came back with suggestions added a lot of value to the debate. I touched on fumikomi in previous articles and talked more generally about footwork in http://wp.me/ptBQt-gZ but I think that it is worth exploring this a little further. Andrea’s sensei’s point that a cut without audible fumikomi is not ippon, I imagine, was made to emphasise the importance of ki-ken-tai-ichi. Technically you can score ippon without fumikomi by sliding your right foot into place with as you strike; you can also successfully make a strike from chudan when you pull your left foot up into position. Footwork is the device you use to ensure that your body is in the right distance and posture to strike correctly, after all it is ki-ken-tai-ichi or mind, sword and body as one; not mind, sword and foot as one. Still it is true that a loud slapping sound made on the point of cutting is satisfying and it certainly helps confirm to shinpan that all the necessary elements are there. David’s comment about the quality of dojo floor was insightful. Training in custom built kendojo in Japan is kinder to the feet than some of the hardwood and composition floors we have to make-do with in other countries. I see more Japanese visitors wearing heel pads than I do locals, who are used to slamming their feet down on un-sprung oak over concrete. 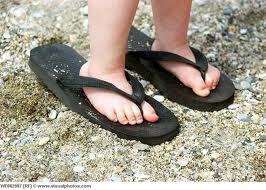 I also liked Ken’s suggestion about training with a slipper or flip-flop. I confess that I got a bit fixated on this and went on to extemporise about the possibility of borrowing from the sub-aqua club and trying it with flippers. Taking my over-vivid imagination out of the equation, it clearly pays to practice how to make correct fumikomi. Like Andrea, I also have a very high instep, but do not find that it affect s my footwork if I do things correctly. My favourite tip comes from Chiba sensei. This was taught as part of the drill to strengthen seme, but has a highly beneficial effect on fumikomi. Starting from long distance you step into issoku ito maai and then whilst holding your opponent in a state of tame, you slightly bend your right knee. Your opponent suspecting that you are about to launch an attack will start an attack of his or her own, giving you the opportunity to make debana men. The side effect of bending your right knee is that the sole of your foot is now parallel with the floor and if your weight is focussed on your left foot, you simply push off from the left and throw your right foot forward, (do not lift your right knee up). As your right foot remains parallel throughout the movement, you make contact with the floor with the maximum amount of foot area and even if your heel hits, it should not hurt as you create a cushion of air between foot and floor. It is the expulsion of this air that makes the slapping sound that should wake up the doziest of referees.